Filling in that blank begins long before a kid applies to college, picks a major, or goes out on his own. Somewhere between finger painting and final exams, he’s on a path toward his future. “What we’re doing in our schools is preparing tomorrow’s leaders, tomorrow’s workforce,” says Jeffrey Butts, superintendent of Wayne Township in Indianapolis. That’s why Indiana University is taking an active role in improving public K–12 education. The Indiana Effective Leaders Academy is an innovative collaboration between the IU School of Education and Kelley School of Business. Faculty members team up with public school leaders to analyze data, discuss best practices, and develop strategies. “It got us out of the mind frame of how we usually think as educators,” said participant Aretha Britton, principal of North Wayne Elementary in Indianapolis. Most participating schools have seen improvement—including North Wayne’s rise from an F to a B. North Wayne’s involvement in the Indiana Effective Leaders Academy came at a time when its district had added 30 minutes to the school day, and Britton wanted every minute to count. Knowing that “one extra degree of effort separates the good from the great,” she and other school leaders created the “extra degree” class. 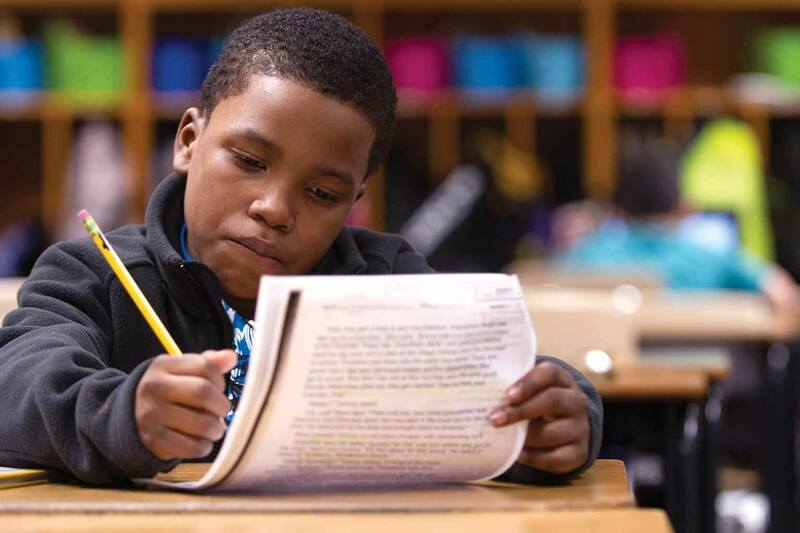 Students do high-intensity, focused language arts exercises—independently or with teachers—and rotate to different stations daily. Accountability is also important. Charts showing progress toward each grade’s reading goals are posted outside every classroom. The Indiana Effective Leaders Academy will continue working with the schools, with the ultimate goal of moving them all into the high-performing category. The business-education collaboration could even serve as a model for struggling schools nationwide. In the meantime, North Wayne Elementary is setting its sights beyond the B. And its students are seeing themselves in a new light, knowing they can achieve great things. Thanks to your generosity to IU, stories like these unfold every day. Your gifts improve the lives of students, faculty, alumni, and countless others across the state, nation, and world.